We begin with pictures from Lübeck - 17Jul2014. We are on our way back from Schwerin where we attended a Senior Couples missionary "retreat" with President and Sr Kosak. Those pics are where we ended in Part 1 of July. The well-known "Tor" into Lübeck. Next, we visited Br & Sr Leschner on their farm across the bay from WHV. They invited us up for a visit to talk "shop" & also let the Elders see a working farm that the Leschners have subsisted on for many years. As I recall we have pictures of the farm building with its date going back to the 1800s. Willi Leschner "watching" the Bratwurst grilling. The Porters helping Br Leschner in "watching" the Bratwurst grilling. Fresh peas in the pod for picking - which we freely did. Yummy! Elders mowing grass "the old fasshioned way"! The Bratwurst were GREAT!!! The grill was homemade and worked wonderfully with the charcoal briquets. We also wished Elder Feild farewell on his last transfer before going home to the USA:-) He did a great job and we enjoyed his personality and efforts a great deal. 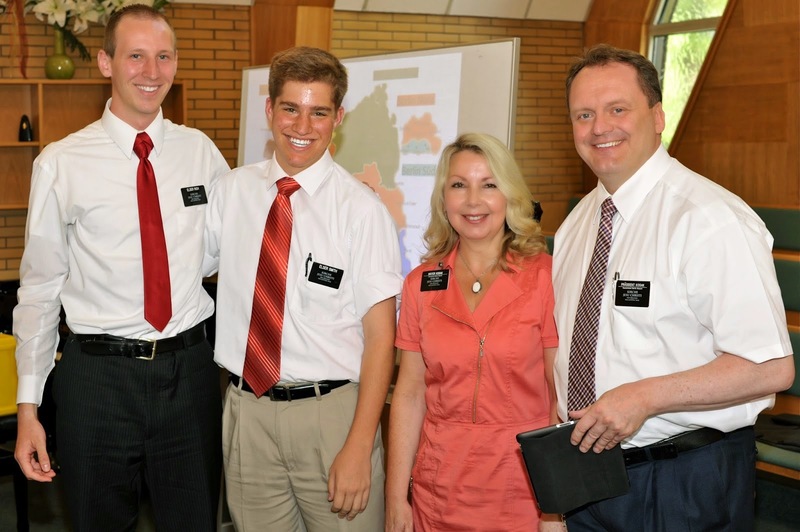 29Jul14 - We welcomed Elder Williams in his place. Of note, Elder Rich began serving as "trainer" for Elder Smith who arrived in Germany from Provo, UT in July 2014.